Let's face it, your wool fitted doesn't cut it in the summertime and your sweaty headband is looking ridiculously dirty. Time to opt for a more functional headpiece, the bucket hat. Traditionally worn by fisherman and farmers, the bucket hat has an all-around brim which protects your eyes and face from the sun's rays. That's just the functionality of it. Style wise, bucket hats are back and the trend is only going to get bigger. The "new" bucket hats aren't the same as the ones Run DMC used to wear. Today, brands have created the hat in windreaker material, denim, and even floral and camo all-over prints. 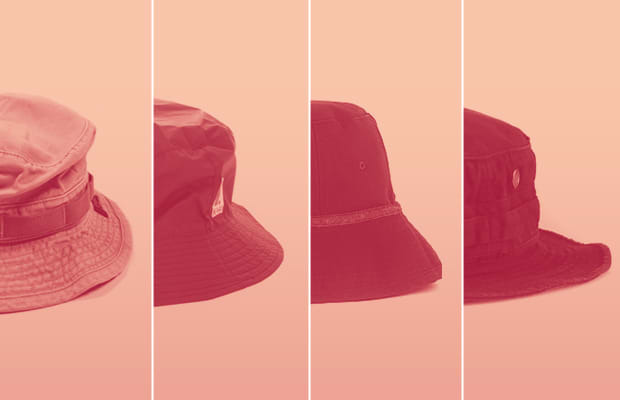 Don't be late, get the Best Bucket Hats Out Now.